"19?? French Live At My Fathers Place vol.II on Chameleon No.0041. This is the 1978 My Father's Place, Roslyn, Long Island show broadcast live by WLIR - I was told that WLIR used to broadcast a lot of strange concerts, and this would be in character, considering the club mentioned was on Long Island ansd so was WLIR. The dat is November 18th in Hot Wacks. 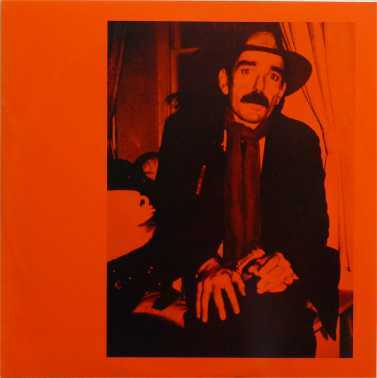 Cover is just a wrap-round and has black on red photo of Don Vliet in a hat and scarf looking like a cornered animal and Don Van Fliet & His Magic Band Live At My Fathers Place Vol.II on the back. Labels are cyan on white with "q" and "b" and feature a cyan chameleon. Side 1 of this is the third quarter of the show while side 2 is the second quarter! This features another cranked-up audience with yells of "we love you Captain Beefheart!!... do you love me!" and endless requests for I Want To Booglarize You! This bootleg also features Beefheart bravely attempting some spoken petry - Old Fart At Play and Well - but during Well he is interupted by clapping and says "cut it out man... this is not in 4 / 4 time... some things are sacred" but at the end says "thank you... ver difficult it is to do poetry in this world of constant.. open all night... and McDonalds!" . "